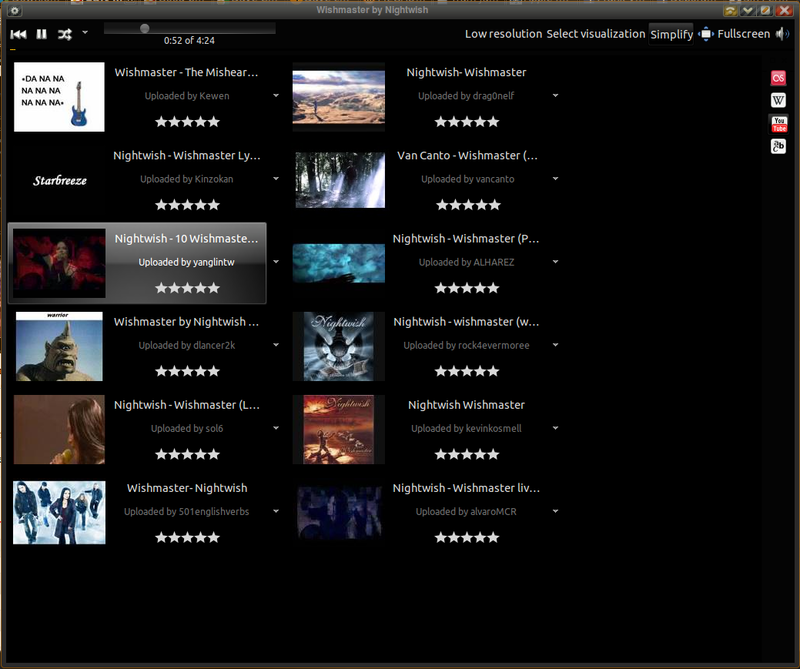 As you probably know, when you open System > Preferences > Appearance, the only way to preview the themes you have installed is to click on them, thereby applying the selected theme. While that’s not such a big deal, it does take a few seconds to redraw everything on the screen, and on less powerful machines this can be quite a drag. 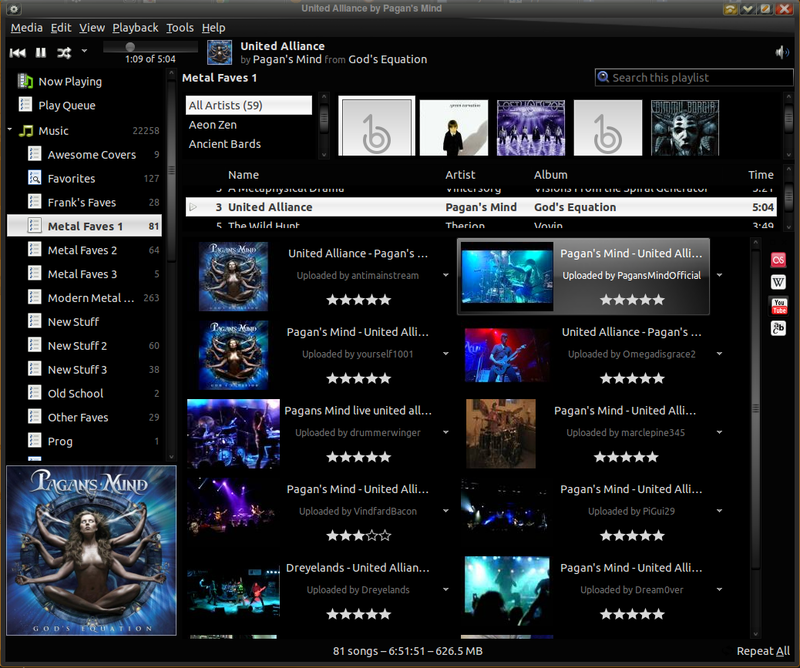 But there are a couple of small apps around that can show you a preview within a single window. They are tiny downloads and easily installed, so if you plan on playing around with themes a fair bit, you should give them a go. Official blurb: ‘Gtk Theme Switch’ based utility that aims to make themes previews and selections as slick as possible. 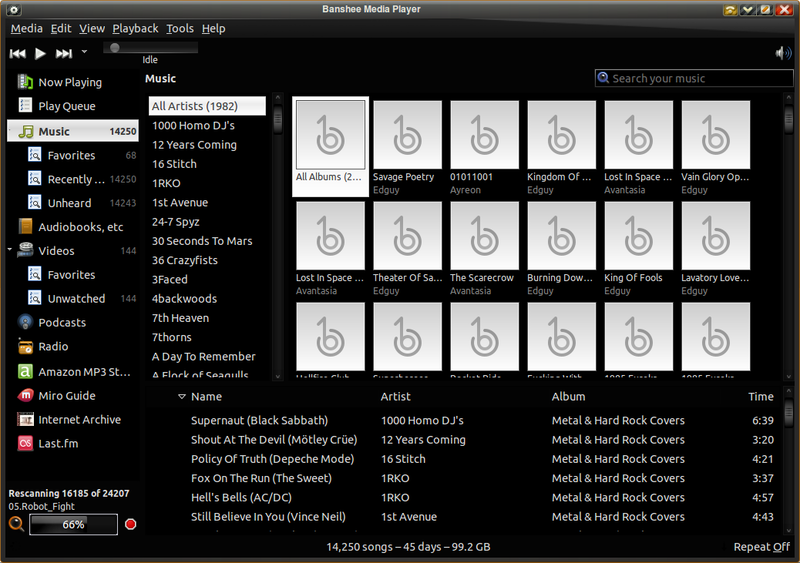 Themes installed on the system are presented for selection and previewed on the fly. As you can see, everything you need is in the one small window. Simply click on a theme name to see everything in that window change. When you find one you’d like to change to, click Apply. Official blurb: Utilities to easily switch GTK+ themes that can be run from the console, and has an optional GUI dock and theme preview. 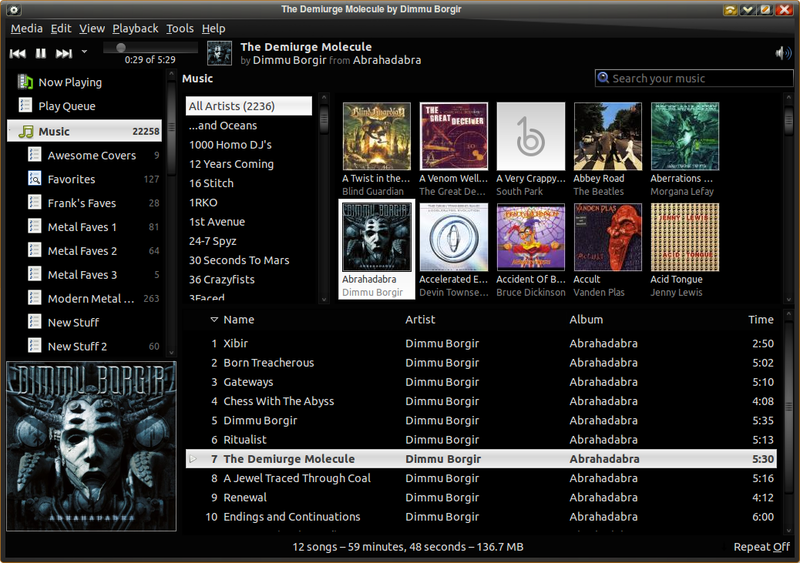 It can install themes downloaded from gtk.themes.org as well straight from the tarball. Just select a theme and click Preview to see a small sample of it open in its own window; you will need to close each preview manually, as it does not reuse the current window. When you find one you’d like to change to, click Apply. This should install all the needed MySQL stuff, as well as some packages AnyMeal will need, like the KDE Wallet Manager (since AnyMeal is in fact a KDE program, but runs absolutely fine in Gnome once it has installed a few KDE packages). Once installed, open AnyMeal (Applications > Accessories > anymeal), click the Connect button, and enter your normal password to open the KDE Wallet Manager. You will then be presented with the “Connect To Datasource” dialogue, and you will notice the default Server is “Embedded“, with User being your username. 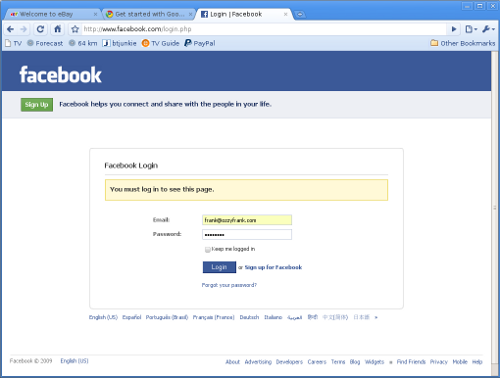 You’ll need to change the Server to “Network“, which will be listed as “localhost“, and set the User to “root“. However, this will only work once you’ve created a user called “root“. If you have never created a password for the root user, you will be doing so shortly, so make sure you write it down somewhere, as it is something you don’t want to forget! Click the New button at the bottom of the dialogue box, then Next when you get to the “Welcome to AnyMeal” message. You’ll see pretty much what you saw before, so change the Server to “Network“, and the User to “root“. Then click the Connect button beneath, then Next. In the next screen, you will be asked for a name for the database, which you can just leave as “anymeal“. Click the Create/Connect button, followed by Next. In the “Setup MySQL Datasource” box, you can leave the Client as “localhost“, but change User to “root“. You will then need to enter the password for root, and confirm it, then click Create/Use, then Next. You will then be told “You can import some recipes already, if you want to” (if you do, click the Import Recipes button), so click Finish. You are now ready to start adding to your recipe database, which you can do via Edit > New Recipe (or the “Edit new recipe” toolbar button). You can also use File > Import > Mealmaster (or the “Import recipes from Mealmaster-file” toolbar button) to import recipes stored in the .mmf format for the popular Mealmaster program. Just do a Google search for “Mealmaster recipe” and you’ll find thousands online to choose from. Open a desired recipe in a new tab, then click the small “Display Recipe for Import” link at the bottom so it opens as text-only without all the banners and links. Save the page, but make sure the extension is .mmf, not .txt or .html; it is very likely most recipes you will come across will be either plain text (.txt) or a web page (.html) – since the browser knows how to display these – so just rename the suffix to .mmf (and don’t forget to give it a descriptive name). You will occasionally come across web pages with multiple recipes in Mealmaster formatting one after the other, so you will need to copy and paste each recipe into its own .mmf text file. Similarly, if you find a site that has one recipe per page, but has no plain text version to view (ie: the page also has images and links), you will need to copy the text and paste it into new .mmf files for importing. 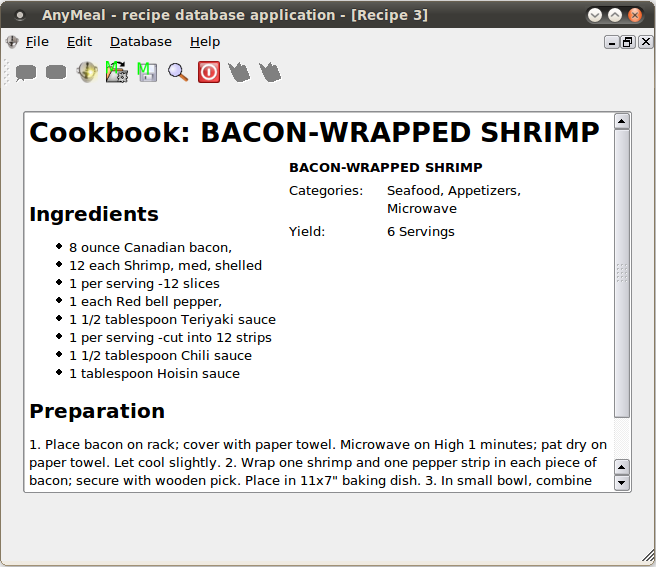 In AnyMeal‘s “Batch Import Mealmaster” box, click Add and browse for and select a recipe you downloaded. You’ll notice the file has been added to the import list (which can feature multiple files), but the OK button is disabled. Next to Input Encoding you will need to select “UTF-8“, then under Handling Of Erroneous Recipes select either “Abort on error” or “Ignore errors“, then click OK. When you return to AnyMeal, it will probably look empty, but if you go to Edit > Search (or click the “Search recipe by title and category” toolbar button) and click OK (no need to type anything), your imported recipes will appear. You might need to do this again if the list of recipes is not refreshed after adding more. To view a recipe, simply double-click it. If it is maximised, you can use the Search button to get back to the recipe list, unless you have a Back button at the top of your keyboard, which should work fine. Of course, you can also just use the Restore button (between Minimise and Close) to restore it to a smaller window, and you’ll be able to see your list behind it. Just make sure you don’t use the Restore button in AnyMeal‘s titlebar, but the one in the row of buttons beneath. To delete a recipe from the database, right-click it and choose Delete. You’ll notice while you’re in the context menu that you can also Export your recipes in a number of formats, so you can even share your own recipes with Mealmaster users. Also, you can choose to Edit a recipe, and you’ll see just how well AnyMeal did with converting that plain text file you imported into useful and editable information. You can add your own ingredients, change quantities and amount of servings, etc, as well as change the title. The latter is useful as many imported recipes will contain recipe numbers, or be in upper-case (which you can be forgiven for finding annoying! ), and even contain typos, all of which can be edited. It’s also the place to change ingredient names to those you use in your own country, like if you’re an Aussie you’ll probably prefer to see “prawn” instead of “shrimp” (especially since we call tiny prawns “shrimps“), and “chick peas” instead of “garbanzo beans“. And let’s not forget converting American measurings (ie: pounds and ounces) to the modern metric system the rest of the world uses (ie: kilos and grams)! For some info on the recipes stored, like the total amount of ingredients for all recipes in the database, go to Database > Database info. This should be all the info you need to get you started, so have fun saving your recipes, and of course browsing through all those recipes you’ll be importing! » Note that if you disconnect from the database and then reconnect, you will be asked for your password again to open KDE Wallet Manager, but since it is already open, you can actually ignore it and click Cancel. » If the fact that the launcher is all in lower-case (ie: “anymeal“) bugs you, just right-click the Applications menu, choose Edit Menus, select the Accessories folder, then select anymeal and click the Properties button to the right of it, enter the new name (ie: “AnyMeal“), and click Close. » For command-line options, check out the manpage (you can pick your version of Ubuntu under the top banner, though it really shouldn’t make any difference). » You can resize AnyMeal so that your list of recipes is accessible on one side while viewing recipes on the other. 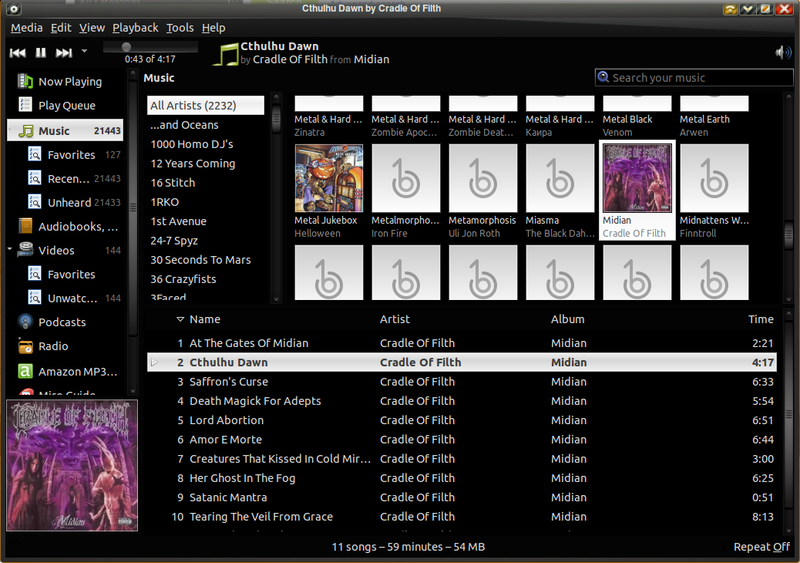 K3b is a versatile CD/DVD burning utility that makes a great addition to anyone’s arsenal of multimedia apps. It has features many others lack, like the ability to successfully burn VIDEO_TS folders to playable movie DVDs, and even if you’re happy with your current burning app, it’s good to have just in case. But it is so feature-rich and easy to use that it could well become your disc burning app of choice. K3b is actually made for KDE (Kubuntu’s desktop environment), but runs fine in Gnome. If you have KDE installed as a secondary desktop environment, then you’ll already have all the libraries and dependencies K3b will need; if you’re only running Gnome, when you install K3b any bits and pieces of KDE it needs will be installed along with it. It will probably look a bit different than your Gnome apps, because it will be themed by KDE, but should work absolutely fine. K3b is user-friendly, yet has advanced options, and is even customisable. If you’re using another app and come across something it can’t do for you, you’ll probably find K3b has no such problem. And even if K3b can’t seem to do it, there is probably a way, if you just look around. In this post you will find all tips related to K3b, so hopefully you can find answers for your burning needs, whether you currently use another program (like the default Brasero) or already use K3b. If you don’t already have K3b, you can install it via Synaptic, or enter sudo apt-get install k3b into a terminal. Any dependencies will be installed automatically. 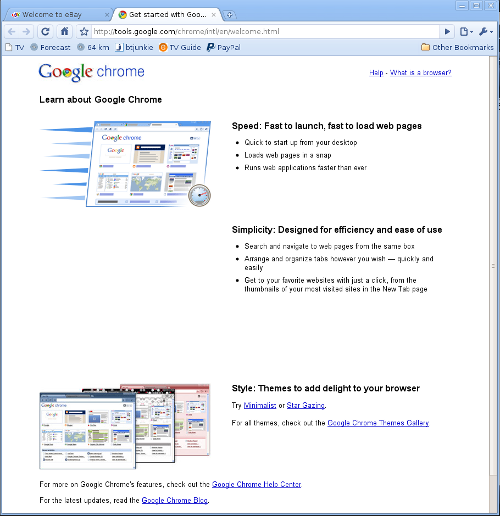 Google Chrome is a fast and lightweight web browser that has already become the 3rd most used browser on the planet. OK, so at 4.4% of the market it isn’t threatening to topple Mozilla Firefox or Microsoft Internet Explorer, but it has pushed my beloved Opera out of that position in a fairly short time. Basically, it is a very slimmed-down browser with less screen real estate being taken up by things like a menu bar, and in independent tests has proven to be much faster than other browsers. For this speed boost, Google employs its own technology which many experts claim have Mozilla and Microsoft scrambling to match, let alone better. Also, security is something the developers take very seriously, and once again has proved equal or superior than its counterparts in independent tests. For more detailed technical info and browser comparisons, just search online with your favourite search engine (funnily enough, Google comes to mind), but you can check out the Wikipedia article for a good introduction. Note: Installing Google Chrome will add the Google repository so your system will automatically keep Google Chrome up to date. If you don’t want Google’s repository, do “sudo touch /etc/default/google-chrome” before installing the package. Note that simply downloading the installer won’t do this, but the repos will be added during installation. And you may notice that if you don’t want the repos added, there is a command outlined to prevent this, though I would suggest you let Google Chrome update itself, to keep it stable and secure. Once you’ve downloaded the file, double-click it to proceed with the install. In the first dialogue that appears when you start Google Chrome for the first time, you’ll see you can import settings from your browser. If you have Firefox, then this is simple, but if you have another installed, like Opera, then it may not appear in the list (in my case, I have multiple web browsers, and only Firefox was available to import from). You’ll also notice you can have crash information sent back to the Google developers; the default (surprisingly) is not to send any info, but if you plan to keep using it and want to help improve stability and performance, you might consider enabling this before proceeding. 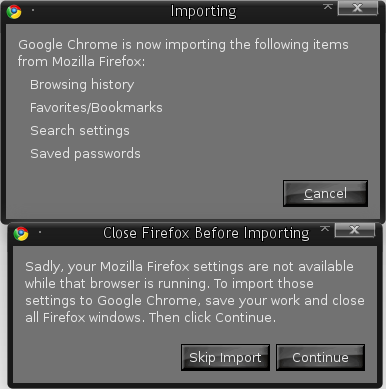 If you have Firefox open, it will complain that it could not import settings due to this. Simply close Firefox, then click the Continue button to proceed with importing your Firefox settings, bookmarks and passwords. When Google Chrome finishes loading, it will likely open your Firefox “Home” page as the first tab, as well as an introductory page for the program itself. 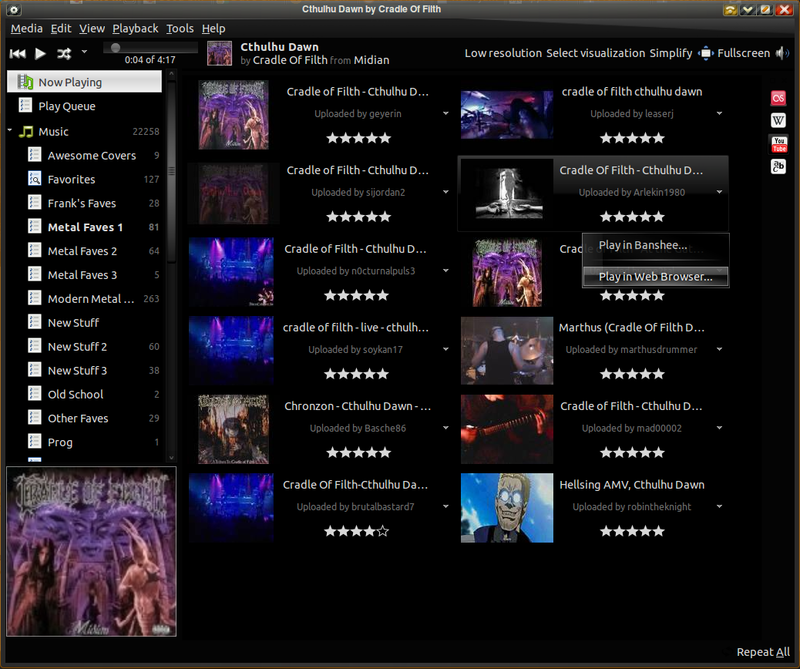 If you look to the first pic, you’ll see it also grabs any links you added to Firefox toolbars. When you click the + button at the end of the tabs to open a new tab, you will find a customisable page for links which is similar to Opera‘s Speed Dial. Unlike the latter, however, you can’t really add new links at will, as it is more like a history of most frequently visited pages, but you can remove thumbnails for those you don’t want there (and also “Keep on this page“ any you want there permanently). 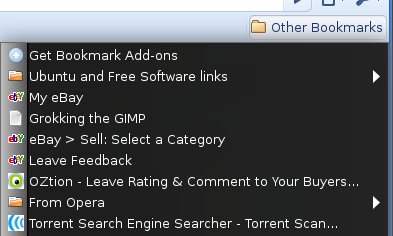 It’s worth spending a few minutes customising this page (once you’ve surfed a few sites), as it can be quicker than opening a blank tab and then finding the link in your Bookmarks menu, like you’d do in Firefox when opening a frequently used page. And if you’re wondering where your imported bookmarks got to, just click on the Other Bookmarks button on the far right. When you go to your favourite sites, you’ll see any login information would have been imported, and you’ll be ready to log into Facebook, MySpace or eBay with a click. 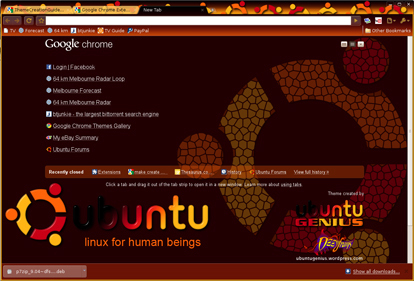 And if you’re wondering about customisability, while the window border obviously does not use your GTK or Compiz/Emerald theme, note that you can skin Google Chrome with the many themes available, like you can do with Firefox and Opera, as well as install all sorts of useful extensions. 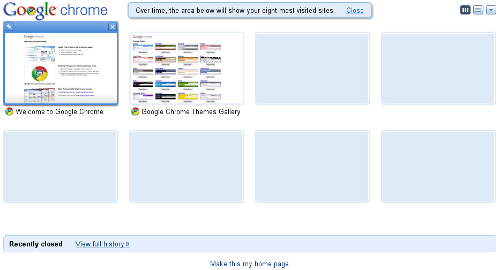 Once the browser is installed, go to the settings/spanner button to the far right of the address bar (it will say “Customize and control Google Chrome” when you hover your cursor over it), choose Extensions from the menu, and on the page that appears telling you you have none, click the “browse the gallery“ link to look for goodies to install (use the Search field to look for “theme“ and “skin“ if you just want to change the look and not wade through hundreds of other extensions). 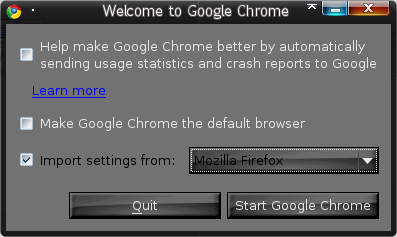 As you can see, it is no major pain setting up Google Chrome, and currently is just a 12.8Mb download, so you may want to give it a try, even if you just want a backup browser in case Firefox misbehaves and you don’t want to reboot. And if you’ve been having issues with your browser, or just prefer something more lightweight yet full-featured, this just may be what you’ve been looking for. Note: Currently the Linux version is still a “beta”, but on my 64-bit Ubuntu 9.10 “Karmic Koala” system, seems perfectly stable.